Here's another new PennSound author page to start your week off on the right foot: this time it's for Canadian poet and critic Trish Salah. The earliest of the recordings archived here is from the 2009 ADFEMPO (Advancing Feminist Poetics and Activism) conference, organized by Belladonna*, which took place on September 24th and 25th of that year. Salah appeared as part of a panel on "Body as Discourse" chaired by Kate Eichhorn that included Joan Retallack, Laura Smith, Nathalie Stephens (Nathanaël), and Ronaldo V. Wilson in addition to Salah, which explored "questions of the body, referentiality, remapping bodies and borders, intertextuality, narrativity, aesthetics, and the challenges of de-essentialization as we scrutinize 'female,' 'queer,' 'raced' and 'othered' bodies." 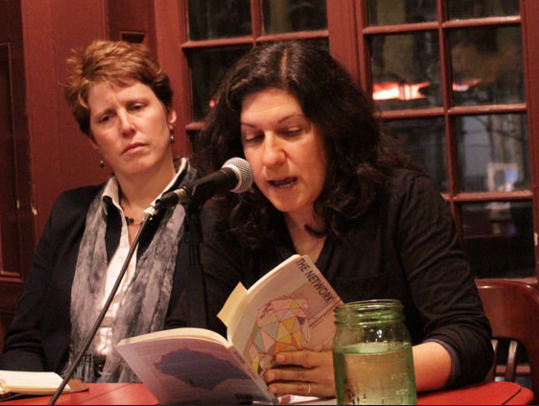 Beyond that panel, there's a brief set as part of a Belladonna* Reading Series event on Transfeminism and Literature from 2012, and Salah's Segue Series reading at the Zinc Bar in March 2013. Click the title above to start exploring. 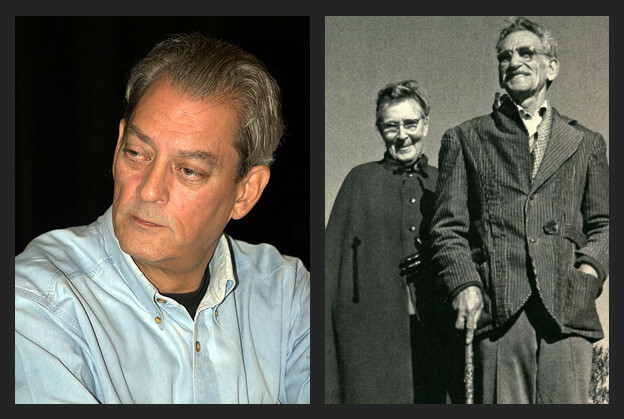 Today at Jacket2, we've published a tremendously exciting piece that came our way through the good graces of Richard Swigg: "No Form in Mind" is Paul Auster's 1980 interview with George and Mary Oppen. Presumed lost for many years, Swigg discovered this historic interview — Oppen's last — among Auster's papers in the New York Public Library's Berg Collection in 2014. Unfortunately, that was too late for his 2012 collection of interviews, Speaking with George Open, but he very kindly shared it with us and provided a brief critical intro. "When Paul Auster in 1980 asked to interview his friend George Oppen," he begins, "the poet agreed, but with a warning. 'What worries me,' wrote Oppen, 'is the question of whether or not I can say anything that I have not already said — And my own condition at this moment which is something alas, very like senility — I am not being very brilliant these days, and I have not written anything since Primitive.'" He needn't have worried: as Auster notes, this lengthy exchange contains "blazing wit, spontaneous remarks as precise and funny as anything I had ever heard him say." You can judge for yourself here. Thanks to A.L. Nielsen we've got a set of wonderful new recordings surrounding this year's Louisville Conference on Literature and Culture since 1900, which have been added to his Heatstrings series page. From the conference itself, we have a February 19th panel organized around What I Say: Innovative Poetry by Black Writers in America, edited by Nielsen and Lauri Ramey, which was reissued in an updated second edition last summer. 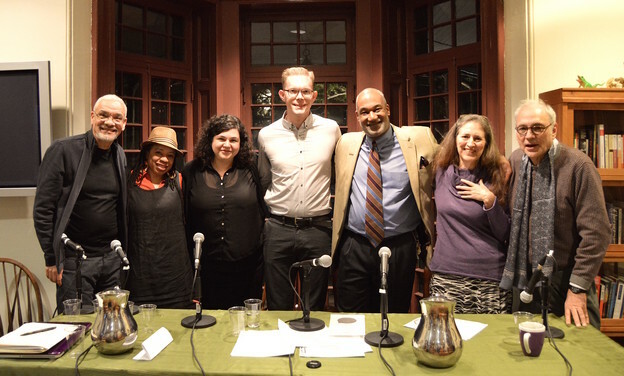 This panel, chaired by Nielsen and with a response by Ramey, featured contributions from four poets enclosed in the anthology: Tyrone Williams, C.S. Giscombe, Pia Dias, and Nathaniel Mackey. Next, and also from the 19th, there's a late-night reading by Mackey as part of the Lute and Drum Reading Series. Finally, from February 20th, the annual tradition of an informal reading at Alan Golding's house continues with an exciting lineup that included Joshua Adams, Jane Augustine, Jon Curley, Joel Duncan, Norman Finkelstein, Michael Heller, Jeanne Heuving, Burt Kimmelman, Mark Scroggins, Ken Taylor, and Barrett Watten, along with Nielsen, Giscombe, and Mackey. You can browse these and many other Heatstrings recordings from Nielsen's archives here. "To celebrate the one hundredth episode of PoemTalk — the series began in 2007 and is ongoing — producer and host Al Filreis convened seven poet-critics who had participated in previous episodes: Herman Beavers, Maria Damon, William J. Harris, erica kaufman, Tracie Morris, Steve McLaughlin, and Charles Bernstein. These seven were asked to listen again to the series and choose two episodes that in particular stimulated new thinking or the desire to revise, restate, reaffirm, assess, and/or commend. 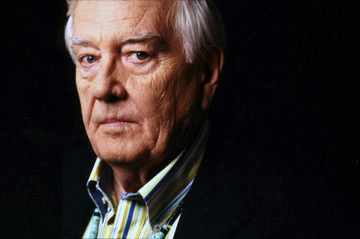 During this special session — presented to a live audience at the Kelly Writers House — each of the seven spoke on one episode for a first round, then a second selection of seven episodes for a second round. This was followed by a discussion of the podcast as a form with its methodological and even pedagogical aspects." The show is presented in two formats: the edited podcast in MP3 format and the complete unedited event as streaming video. You can experience both and read more about the program — including the lineup of previous podcasts discussed by each panelists — along with a long list of shout-outs from Filreis on Jacket2. 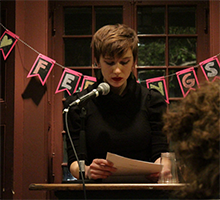 Our week closes out with the latest offering from the Whenever We Feel Like It Reading Series, curated by Committee of Vigilance members Michelle Taransky and Emily Pettit. Recorded on February 10, 2016, this event featured three readers altogether. Kenna O'Rourke is the managing editor of Jacket2, and has published work in The Pocket Guide, the Philos Adelphos Irrealis chapbook, and McSweeney's Internet Tendency. Northampton, MA author Rachel B. Glaser has published a novel (Paulina & Fran), a volume of poetry (MOODS), and a collection of short stories (Pee On Water). Mark Leidner has authored two poetry collections: Beauty Was the Case that They Gave Me and The Angel in the Dream of Our Hangover. Though we really shouldn't need to remind you, The Committee of Vigilance is a subdivision of Sleepy Lemur Quality Enterprises, which is the production division of The Meeteetzee Institute. 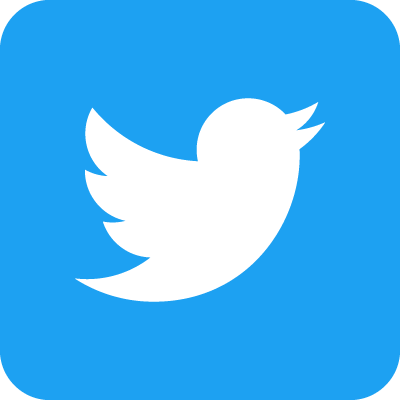 You can browse previous Whenever We Feel Like It readings here. 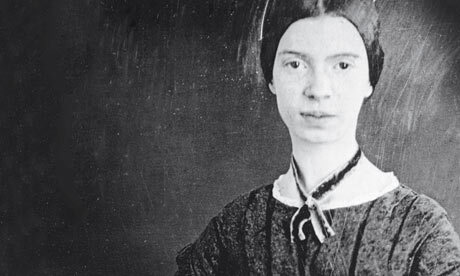 One-hundred-and-thirty years ago today, Emily Dickinson died in Amherst, Massachusetts at the age of fifty-five. To mark the occasion, we'll take another look at the new PennSound author page for the poet we first launched six months ago. We start, appropriately enough, with Susan Howe. There are a number of talks on Dickinson dating from 1984 (from the New York Talk series) and 1990 (from SUNY-Buffalo), as well as a few smaller excerpts from recorded lectures.You'll also find a link to PoemTalk #32, which discusses Howe's interpretation of Dickinson's "My Life had stood - a Loaded Gun." We've got complete series of lectures on Dickinson from Robert Duncan and Robert Creeley, both at the New College and dating from 1981 and 1985, respectively. Another relatively-new addition to the archive is the 1979 Dickinson Birthday Celebration at the St. Mark's Poetry Project (featuring Jan Heller Levi, Charles Bernstein, Susan Leites, Charles Doria, Virginia Terrace, Barbara Guest, Madeleine Keller and Vicki Hudspith, Armand Schwerner, Karen Edwards, Jackson Mac Low, Maureen Owen, and Howe), along with Rae Armantrout's 2000 presentation on Dickinson from "Nine Contemporary Poets Read Themselves Through Modernism." Finally, there are performances of individual Dickinson poems from John Richetti and Jeffery Robinson as well as brief excerpts of radio interviews — with John Ashbery, Guest, and Elizabeth Bishop — pertaining to the poet. To start exploring these diverse resources, click here. Today we're highlighting the inaugural offering from a new series being held at our Kelly Writers House. Organized and hosted by Davy Knittle, "City Planning Poetics" will hold events once a semester "that invite one or more poets and one or more planners, designers, planning historians or others working in the field of city planning to discuss a particular topic central to their work, to ask each other questions, and to read from their current projects." The first event, held this past February 24th, asked the questions "What is a map? What can a map do?" of guests Jena Osman and Amy Hillier. Osman is a Professor of English at Temple University, where she teaches in the MFA Creative Writing Program, and the author of a number of books, including her most recent, Corporate Relations (Burning Deck, 2014). Hillier teaches GIS courses in city planning, urban studies, and social work at UPenn's School of Design. Her research has focused on spatial health disparities including access to healthful foods and exposure to outdoor advertising. You can either watch streaming video of this fascinating event or download the nearly-90 minute recording in MP3 format here. We'll look forward to new additions to this series. Here's an exciting new addition to our roster of reading series: the Poets in the Cafe reading series from the School of Life in Melbourne, Australia. The readings are curated and hosted by Robert Wood, who's produced several fantastic articles for Jacket2 on Australian Aboriginal poetry and poetics over the years and will be publishing a new piece with us in the near future. Altogether we're presenting seven readings — by Bonny Cassidy, Luke Beesley, Jess Wilkinson, Matt Hall, Kent MacCarter, Melinda Bufton, and Autumn Royal — that took place over the last twelve months and we look forward to hosting more recordings as time passes. Those eager for more Australian poetry should check out our massive Anthology of Australian Poets, curated by Pam Brown as a complement to her equally-ambitious Jacket2 feature, "Fifty-One Contemporary Poets from Australia." 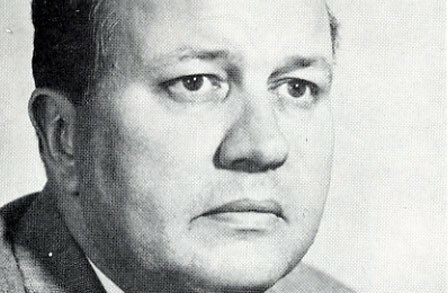 Today would have been the one hundred and eighth birthday of poet Theodore Roethke, a Pulitzer Prize and two-time National Book Award-winning poet, who died at the age of fifty-five in 1963. In honor of the occasion, we're highlighting three Roethke poems read by UPenn professor emeritus as part of his audio anthology, "106 Favorite Poems, Good for Memorizing," which he recorded for us in 2014. In his rich and resonant fashion, Richetti offers up his renditions of "Dolor," "I Knew a Woman," and what's perhaps his best-known poem, "The Waking." Those interested in reading along can find copies of the poems on the Poetry Foundation website. 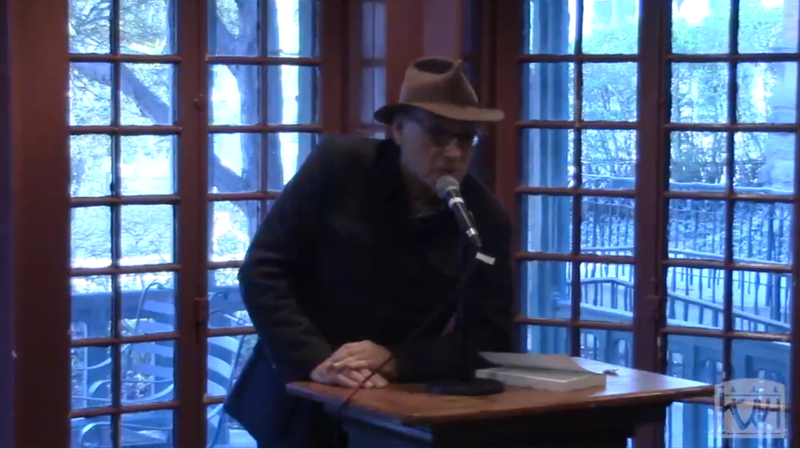 To wrap up this week we're highlighting the recent launch event for Charles Bernstein's latest book, Pitch of Poetry (University of Chicago, 2016) at our own Kelly Writers House. Recorded on April 12th of this year, this celebration begins with a lavish introduction by Bernstein's PennSound co-director, Al Filreis. Next Bernstein takes the podium, beginning with the book's preface, followed by "Leslie Scalapino's Rhythmic Intensities," his tribute to the late poet, first presented at a St. Mark's Poetry Project memorial event in June 2010. Next, he reads a 2013 interview with Stephen Ross from Wolf, with Ariel Resnikoff serving as interlocutor. Finally, he closes the reading with a few selections from "The Pataquerical Imagination: Midrashic Antinomianism and the Promise of Bent Studies," from the book's final section. You can experience this wonderful event via either streaming video or downloadable MP3 audio by clicking the title above. 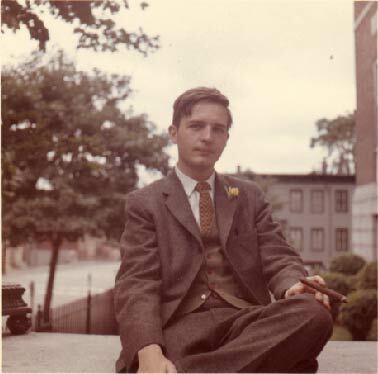 We've created a new author page for Michigan-born poet and artist Gerald Burns (1940–1997), seen at right during his undergraduate years at Harvard University. Altogether there are three readings, the first two dating from 1984. From October 26th of that year there's a short set from Shakespeare and Co. Bookstore in Dallas that starts with an unidentified poem before moving on to "Nine" from Boccherini's Minuet and three titles from Twenty Four Gnomic Poems: "Emerged for Immersed," "Fame in Retrospect," and "Written under German." Then from December 14th, there's a longer reading from Dallas' Still Light Gallery, consisting largely of selections from Twenty Four Gnomic Poems including "Homer and Image," "Imagining a World," "Concocting the Other," and "All Black Matches." Jumping forward to 1988, our last recording was made on June 12th at the Dallas Institute of Humanities and Culture and showcases excerpts from The Passions of Being. We're grateful to David Searcy (Burns' literary executor) and Jim Hanson (who provided recordings) for their help in bringing this page about. To start exploring our Gerald Burns author page click the title above, and to learn more about Burns, be sure to check out the Gerald Burns Society homepage.